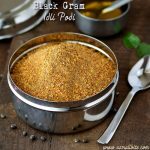 Today I have shared a simple post Garlic Podi Recipe / Poondu Idli Podi Recipe with step by step pics. 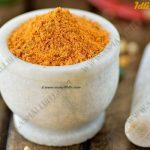 I have another version of Idli Podi in my space, but this one with addition of garlic is more flavourful and much cheaper than ready made packets. It’s always a perfect and tasty accompaniment for idli and dosa. Though I prepare chutney for breakfast, this podi is a must side dish in my family, I think this would be the regular scene in most of your homes also. 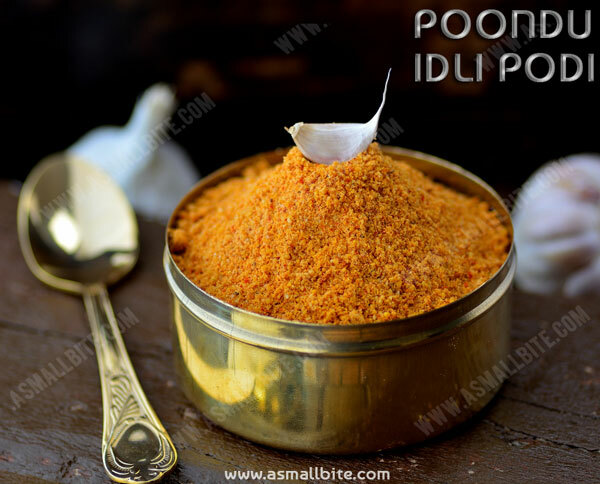 This podi stays good for 2 months and if you want to prepare in large quantity, just double or triple the ingredients. I usually add this podi, to the regular poriyal / stir fry to make it more tastier. 1. Peel the skin of garlic and chop it finely. Measure and keep all the ingredients ready. Heat a pan, add chana dal and start roasting in low flame till medium brown. 2. Then add red chilli, hing and roast again. 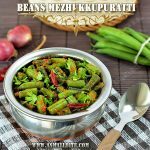 Now add urad dal to it and roast everything till golden brown. Do the whole process in low flame and don’t burn it, else it taste bitter. Keep it in a separate plate. 3. Heat oil in the same pan and add chopped garlic. Fry till crispy and nice smell wafts .Ensure that the garlic is not burnt and it is not soggy. 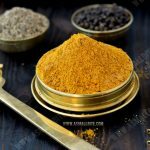 As burnt garlic, gives bitter taste and spoil the whole podi. Also if it is soggy, it will turn like paste while grinding. 4. Spread everything in a wide plate and allow it to cool completely. Transfer the ingredients to a mixer, add required salt and grind it to a coarse / smooth powder as preferred. 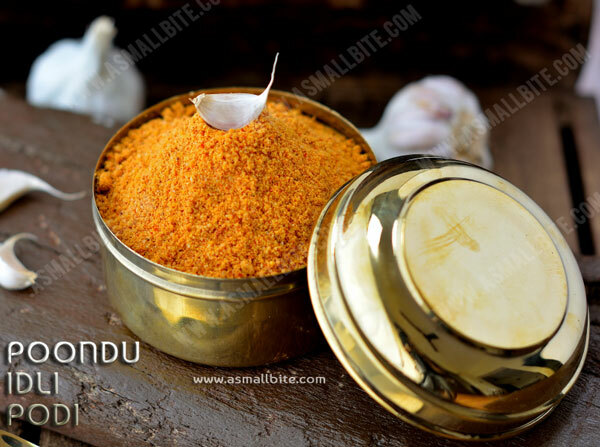 But this poondu milagai podi taste better with coarse texture. 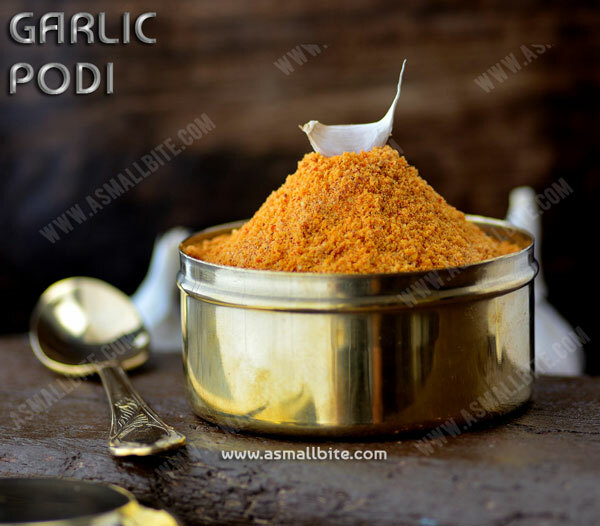 Serve this garlic podi with soft idli / ragi dosa. 1. Adjust red chilli as per spice level preferred for this garlic podi recipe. 2. 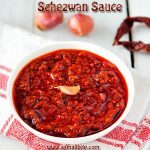 For bright and vibrant red colour, use kashmiri chilli. 3. Always roast red chilli with dal for even roasting, if roasted alone it gets burnt. 4. If preferred you can use the garlic with skin, it also gives nice texture and look. But I peeled the skin. 5. Use small garlic as it gives more flavour, large garlic (malai poondu) will be easy to peel, but less flavourful. 6. Roast garlic till crispy not soggy, else it turns into a paste while grinding. 7. If the podi turns into paste, dry roast it in a pan on low flame, then grind it again and cool it. 8. For extra flavour, few curry leaves can be added to this poondu idli podi recipe. 9. Do the whole process in low flame to avoid burning, else the podi taste bitter. 10. The colour of the podi depends on the type of chilli used. 11. Shelf life of this podi is 2 months when stored in a clean and dry container. 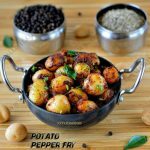 Hi there, I wanted to know how to salvage podi that’s turned bitter. I am not sure if it’s the garlic or over roasting sesame seeds but my podi is tasting bitter 🙁 . Is there a way to salvage this? Hi ,Aparna I think you have burnt the garlic when roasting .There is no way to reverse it ,but try to add a very little bit of jaggery and just grind it once .But anyhow the garlic flavour will be missing.Try it patiently next time and let me know your feedback.